Back in the band from October 4, 2009, when Denny Freeman had quit. Recorded a series of demos with Dylan in the fall of 1983. Austin Texas, Oct 26 and 27, 1996. 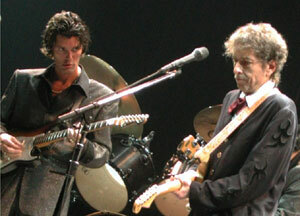 Charlie was replaced by Billy Burnette from the Feb 6, 2003 show in Canberra. fronting the barband in the scenes leading up to the killing. He sort of looks like Matt Dillon's skinny cousin. > line up, guitar wall ala rolling thunder? his teeth as a "child prodigy" with Joe Ely. 80's with "Beats So Lonely" as one of those big hair rockers. very strong effort and deserved a lot more exposure than it got. possibility  of some new arrangements. I answer some of my own questions:  I guess he'd be 31 or 32.
teens he toured with groups ranging from David Bowie to Joe Ely. was only 16. This albums sound would be regarded as "New Wave". straight ahead blues and rock n' roll. nightclub singer. Sexton now lives in Austin with his wife.